Dream House (2011) is a supernatural thriller movie starring Daniel Craig, Rachel Weisz, and Naomi Watts. Synopsis from IMDb: Some say that all houses have memories. For one man, his home is the place he would kill to forget. A family unknowingly moves into a home where several grisly murders were committed... only to find themselves the killer's next target. Successful publisher Will Atenton (Daniel Craig) quit a job in New York City to relocate his wife, Libby (Rachel Weisz), and their two little girls, Trish (Taylor Geare) and Dee Dee (Claire Geare) to a quaint New England town. But as they settle into their new life, they discover their perfect home was the murder scene of a mother and her children. And the entire city believes it was at the hands of the husband who survived. When Will investigates the tragedy, his only lead comes from Ann Patterson (Naomi Watts), a neighbor who was close to the family that died. As Will and Ann piece together the disturbing puzzle, they discover that the story of the last man to leave Will's dream house will be just as horrifying to the one who came next. The synopsis sounds good but the poster and its tagline don't really match the storyline. You might think the whole story revolves around the two little girls, but actually it's not. In fact, you will find yourself jerked abruptly from a "dream" when the twist in the movie is presented. That's the best part of this movie, or rather its strength. You'll be amused at how you've been sort of "coaxed" into believing the whole story in the other way round. Goosebumps! That's what Dream House will do to you. 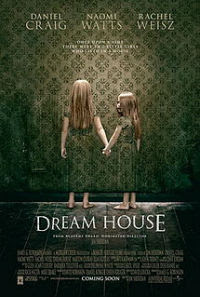 If you're a fan of supernatural-psychology-horror thriller, Dream House might remind you of another similar movie, i.e. The Others (2001) starring Nicole Kidman.